We had some trouble with our scale a year ago during our Biggest Loser program. We had not purchased one that was rated for a high enough weight capacity and it broke. 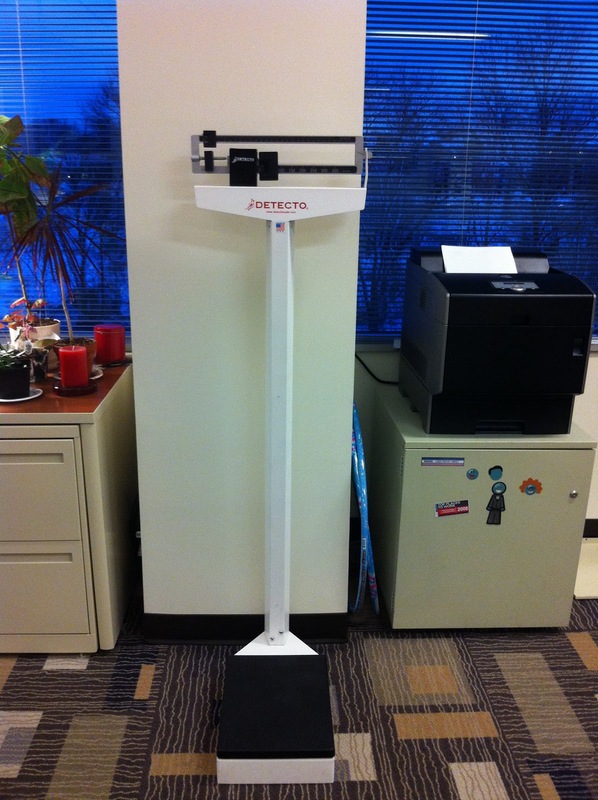 We quickly replaced it and the replacement got us through that program, but we decided we would get a new scale for the kick off of this program. We solicited some recommendations and checked out our options. We wound up selecting Tanita model with a weight capacity of 440 pounds. We did the initial weigh-in in our lunchroom and then moved the scale into the HR area which is carpeted. We placed the scale on a piece of metal, so the carpet wouldn't effect the readings. Evidently that didn't help. The readings varied dramatically from the initial weight in. For example, people recorded weight losses of 22 and 18 pounds which we knew wasn't realistic. So, we pulled the doctor's office type scale from our men's locker room. I'll never buy another type of scale again for the office. A few folks needed a quick tutorial on how to use it and I must say people moaned and groaned at the site of it. It's certainly not as kind as the Tanita was. Did our Biggest Losers keep the weight off?